The Alternative Board Derby has strengthened its partnership with East Midlands Chamber by moving into its offices on Pride Park. TAB Derby became a patron of the Chamber in August last year. During the past last eight years, TAB Derby has worked with 125 businesses across a broad number of sectors, including retail, marketing, manufacturing and accountancy, and training companies. Through Julian and fellow facilitator, Jimi Ball, TAB Derby brings perspective and focus to executives, helping them deal with complex issues at work and at home with support from peer advisory boards and one-to-one coaching. In the past year, Jimi and Julian have helped their members or clients increase their revenue by an average of 25.2% a year (5.4 times the national average). Julian added: “We think the Chamber has a really strong leadership and wanted to add our weight to its offering. “In return we have found its staff to be hugely supportive in helping us with events which showcase our contribution to the business community. “It made total sense to be even more closely aligned when the lease ended on our office in Full Street. 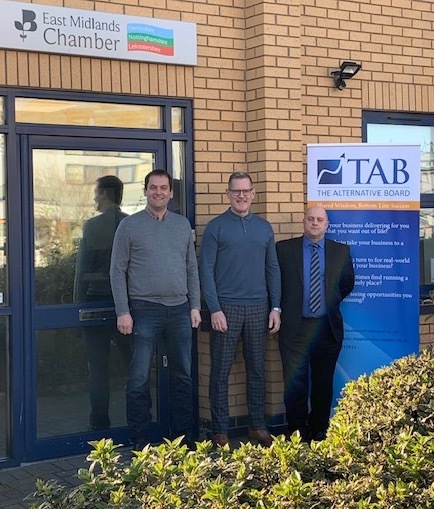 Chamber chief executive, Scott Knowles, said: “TAB Derby has already brought skills and expertise which have complemented other patrons and been a hugely enthusiastic partner.